A liquor shop, a standing bar, and a casual sit-down grill, Bar Maru is many things to many people. Browse the shelves, and if you find something you like you can crack it open on the spot for a modest Y500 corkage fee. Pop into the tachinomiya next door for a quick drink, or head to the second floor for a more comfortable scene. There are about sixteen wines, including homemade sangria and, in the colder months, hot wine. Sit down to a glass of Siglio (admittedly no Gran Reserva, but at Y450, who's complaining?) 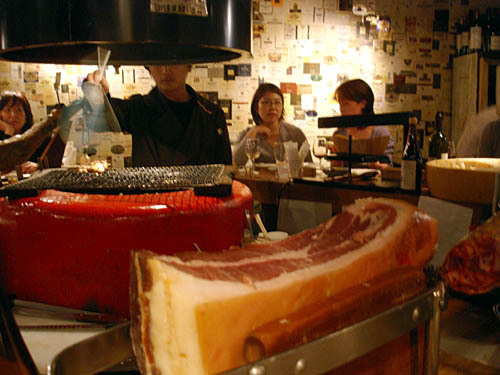 and start grazing on Spanish and Japanese tapas - an array of cured meats, sauteed mushrooms luxuriating in garlicky olive oil, grilled free-range chicken and fresh seafood, all reasonably priced. Get more serious with a big, bold Cabernet Sauvignon from Israel's Yarden Golan Heights Winery and move on to grilled Iberico pork or entrecote steak. 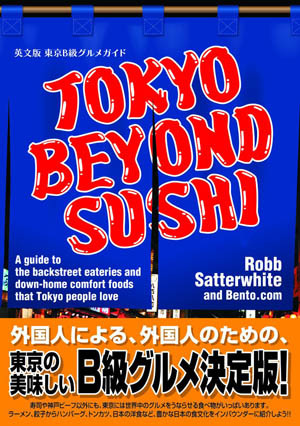 The friendly atmosphere, with its eclectic mix of Shimokitazawa-style hipsters, salarymen, and Hatchobori locals, is as compelling as the food and drink. No English.